You've only got so many options when it comes to home Internet. Don't like the folks who own the Internet-pipes in your neighborhood? Too bad. 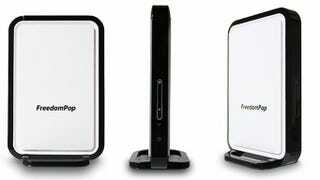 Well, FreedomPop is aiming to put another option on the table: a $89 4G router with free data built right in. The FreedomPop Home Burst Hub is the first non-mobile solution from the same company that's been putting out hotspots and iPod cases with free 4G data packed in. The Home Hub Burst wants to replace your router though, can support up to 10 simultaneous connections, and comes with—a paltry but free—1GB of data each month. Like any FreedomPop device, you can earn free data by jumping through some social networking hoops, but there's also plans starting as low as $10 a month. The Hub will slurp 4G from the speedy but not-exactly-ubiquitous Clearwire network and, according to Freedom Pop, will deliver speeds trounce DSL and rival traditional cable, at a fraction of the price. If that sounds up your alley, you can find out more about it on FreedomPop's site, but you'll want to see if Clearwire is even in your area first. FreedomPop is supposed to be getting Sprint at some point, but it hasn't yet. In the meantime, we can't wait to get our hands on one and see if those speeds are up to snuff. This probably isn't going to unseat any entrenched cable kingpins or anything, but it's always nice to have some options.